an extract from “A Third Ramble About Our Village (Histon)” by Dellas Oates. Nearly seven feet in height and over 23 stone in weight, he was not a fat man but was well proportioned and very strong. He lived alone in a hut built of clay hods in Clay Street and every week he made and cooked a huge beef steak pudding and six large dumplings in an old copper he kept for that purpose. He washed himself and his clothes in “Dodd’s Pond” in Clay Street. He went around the village and to Cambridge pushing a large hand cart with vegetables and could be heard all over the village shouting his wares. He owned and cultivated land on Histon Moor on the way to Cottenham, pulling the harrows himself, “I don’t want no hoss” he said. Children loved him and he would carry them about, two or three under each arm. He would tease little girls and let them kick his legs and would roar with laughter and tell them to kick harder so that he could feel it. He could carry a coomb (18 stone) sack of corn under each arm. He went to Stourbridge Fair and in a boxing booth he defeated all the boxers and threw out the Proprietor when he refused to pay him as promised. For a bet he carried a huge boulder newly dug out of the ballast hole (on Park Lane) and put it at the “Boot Corner”. 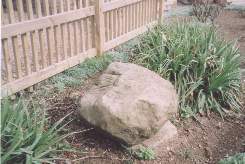 The stone can still be seen at the Boot public house but it has been moved from the corner to the garden at the back. Moses was a kindly man and most popular in the village. There was great consternation when on one occasion he disappeared, only to return a few days later from Ely Fair. He had walked there and back with his barrow! His “Stove Pipe” hat, a ring and one of his hobnailed boots survive. 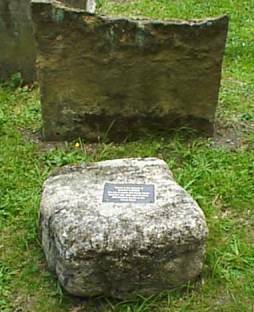 He is buried close by the walls of Histon Church. 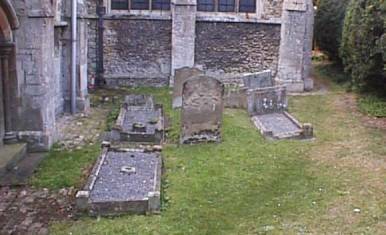 His headstone is crumbling and the inscription has been eroded by the weather but we have a record of this. On Wednesday 8 July 1998, Rev. 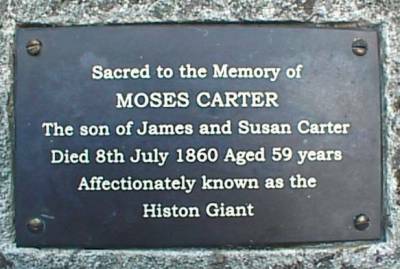 Hugh McCurdy dedicated a new memorial in the churchyard to Moses Carter, the Histon Giant. The date marked the 138th anniversary of his death. Prior to the dedication, a service was held in St Andrew’s. Local Councillors, members of the Village Society, residents and children of Histon & Impington Junior School were present. Moses’ stove pipe hat, hobnailed boot and ring were displayed by some of the school children during the service. A facsimile of the News Chronicle of 7 July 1860. The latter was a weekly paper of the time and this issue was from the week in which Moses Carter died. Mr Alan Eade, chair of the Village Society buried the time capsule, with the assistance of Mr Steve Wilkinson, Chairman of Histon Parish Council, and Mr Denis Payne, Chairman of Impington Parish Council. These poems are a selection of those written by the children, and were read by their authors at the service. With lots of good things to eat. Not at all very small! Then he went to Stourbridge Fair. There was a boxing match held there. Moses threw the man into the air. Soon, the sad time had come. Three days later coming home. On his back in a sling was a boulder. Were two squealing, giggly girls. On top of his head was a stove pipe hat. Full of vegetable and a couple of children. The boulder he put down. And went off to the fair. At the fair he knocked out man after man. Said he was too strong. The giant picked him up and chucked him into the crowd. “Moses!” the crowd cried again and again. For Moses was the Giant’s name! M is for the man who is a B.F.G. O is for oh mighty strength. S is for the smiling children. E is for his everlasting greatness. S is for the savage day he died. With a sack on his back. He was a jolly good bare fist boxer. He washed in Dodd’s Pond down Clay Street. He lived in Nun’s Orchard. Now, if you go to the Boot you can see his rock. And if you go to the Church you can see his Grave. Hi. Thank you for the story. I came across it when researching my family tree. My great grandfather, Bennett Carter, was Moses Carter’s great nephew. I knew there had been a giant in the family but new little of him. I shall show this to my mother who is now 90yrs and remembers visiting her grandfather’s family in Histon as a child. Maybe we’ll manage a trip to the pub to see the stone! Thank you.